The term “political education” often conjures in people a sense of trepidation, leading them to think of hierarchical and rigid processes that drift dangerously towards indoctrination — a word associated as much with the historic socialist and communist parties of Europe as with left critiques of the mass media. While fear of indoctrination is historically rooted and often well founded, the hysteria that tends to characterise more recent scare stories of brainwashing by “Marxist academics” or Momentum members points to a deeper fear often present among the representatives of powerful political, economic and social institutions: that of a politically educated citizenry. Our ability — collectively or as individuals — to enact political change is intimately tied to our ability to make sense of the world around us and to understand and contextualise the actions of others. This learning is often a product of day-to-day experience and is shaped by differences in class, race, region and gender, among others. Yet it can be powerfully supplemented by more explicit forms of political education: a reading or discussion group, for example, or a panel talk or film — the list is long. It is through such activity that we often establish or solidify links between our own experiences and wider shifts in society, the economy and politics — we begin not only to desire change, but to image what it might look like and think how we get there, while in the process developing a sense of our own agency and creative capacity. This is observable throughout historical radical movements for change, including the birth of the trade union movement and the Labour Party, both vehicles for political education and consciousness-raising – albeit ones often limited by bureaucratic imperatives, cultures of managerialism and the pressure of electoral cycles. These limiting factors became overwhelmingly dominant during the leadership of Tony Blair, whose party management were characterised by a top-down control of constituency Labour Parties (CLPs), whose access to critical information and influence within the party was considerably reduced. Underpinning this was belief in the membership as a source of trouble and embarrassment, suitable only for amplifying the leader’s message and incapable of meaningfully contributing to the process of policy formation and strategic direction. This was combined with a more general aversion to “big ideas”, which were sacrificed on the alter of a militant pragmatism that eventually turned out to have disguised a lack of innovation and, ultimately, radicalism. By the end of the Blair years, the Labour Party was left with a dwindling and demobilised membership, largely unused to meaningful political discussion inside the organisation and reduced purely to an instrument to get out the vote. In considering the stultifying legacy of Blairism on subsequent approaches to party leadership, when the 2015 election arrived Labour was ill-equipped to respond to a political-economic model then – and still – in crisis. It lacked vitality and, crucially, the ability to break traditional political thought-patterns. The old was dying, but the new could not be born. 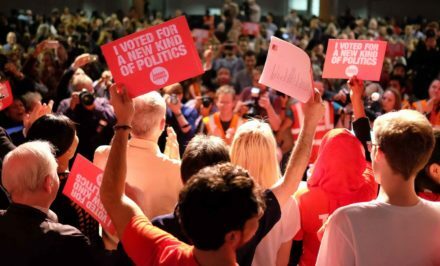 For the new to be born, it is crucial that the Labour Party membership, and the wider movement, engages in an extensive process of collective political education. The membership has the potential to be a powerful intellectual resource — overlapping with trade unions, media institutions, think tanks, civil society organisations — that will provide the impetus for change, shaping the policy direction taken by the leadership. While Jeremy Corbyn has overseen a surge in Labour membership, and his rhetoric indicates a belief in the creative potential of all, there is still considerable work to be done. The manifesto, for example, while undoubtedly transformative was not as radical as it should have been. It is the membership that can change this, but only if the proper intellectual culture and process are developed. This is one of the motivations behind why I, and many others, have for the last two years organised The World Transformed. We see the aim of the event as to create a space in which ideas can be freely exchanged and collectively developed, and those in the movement see themselves as being able to meaningfully contribute. At this year’s event in Brighton we hosted over 300 activists, politicians, musicians and artists as they produced more than 200 hours of content, much of which also provided opportunity for attendees to participate in the production of ideas as well as to learn. Such a space is of course temporary, and undoubtedly exhibits the power dynamics often associated with spaces of political education (whose voice? whose ideas? ), but we hope it kick-starts a much larger process. The “take back control” series of events we ran across Britain this summer were designed to create similar spaces,and empower those local activists we organised with to continue the process, as many were doing already. At the heart of our approach is a commitment to broadening the scope of how we engage with political ideas — integrating art, music, films, poetry, and placing an emphasis on creating welcoming and dynamic social spaces in which political conversation is encouraged and ideas are given further room to breathe. In sum, it is a project intended to contribute to a much broader cultural renewal of the left. What’s more, while the reaction from across the movement, and even in the press, has been overwhelmingly positive, there has nonetheless been a noticeable resistance from some sections of the party. They see The World Transformed’s approach—and the focus on ideas more generally—as an indulgent distraction from the serious business of winning elections. Our response is fairly simple. Labour’s poll ratings may be sky-high, but they are not stable. For this to be achieved then a much broader social and cultural shift needs to happen, and a different set of values needs to become dominant across society: the individualism inculcated during Margaret Thatcher’s premiership, and encouraged by Blair, must be replaced by a shared belief that, ultimately, the better life we all aspire to can only truly be achieved collectively. A politically and intellectually engaged movement is the first step to building this. Andrew Dolan is an organiser of The World Transformed and writes in a personal capacity.